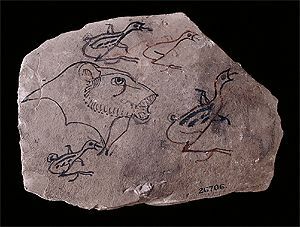 Ducks were very common in ancient Egypt. The ancient Egyptians hunted them on the banks of the Nile. The following piece of limestone was used for practising hieroglyphic signs. The hieroglyph is part of the word for 'vizier'.